So you’ve just bought a wonderful new piece of wall art: a large canvas to take up most of one wall. It must weigh forty or so pounds all together, you think. What a massive, beautiful work! You get it home, knowing exactly where you will showcase. Suddenly, you are presented with a homeowner’s problem as old as time: how to hang it. Wall hanging seems like a relatively simple task, but it is not always as simple as driving a finishing nail through wherever it is on the wall you want your new hanging to go. In the case of our forty pound art canvas, for instance, some nails straight into the wall plaster are not going to do it. First off, it won’t be strong enough, and your painting is likely to fall, but more importantly, you are risking damaging the wall completely. So what is the best way to mount something to a plastic wall? Well, there are many options that can be fastened to the hanging itself. Whether you are using eye hooks, wire, traditional picture hangers, or just the overlap of the frame, this doesn’t matter quite as much as what is happening on the wall itself. In order to ensure a long-lasting, solid hold, attach nails or screws direct into a beam on the walls, these are studs. Despite the knocking technique, sometimes it takes a little bit of a hunt to locate a stud. 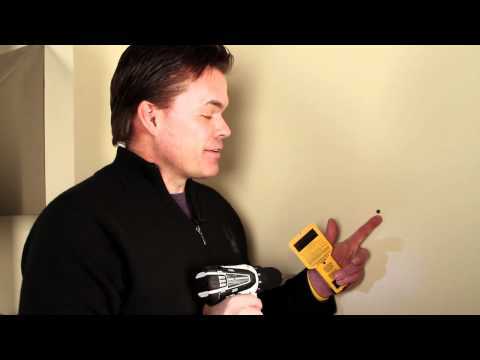 Certainly, you can use a stud finder that lights up or beeps or some combination of both when it has crossed over a stud. However, if you do not have it, we know other low tech ways. In a dark or dimly lit room, thine a flashlight across the wall. Do this by facing the wall, finding a central point, and moving either your body or the flashlight beam to the left or the right to create sharp angles. Look for imperfections exposed by the light. These are likely nail or drywall screw marks, the ones deep in the plaster that secure the plaster to a stud behind the wall. Rule of thumb on framing is that studs are about 16 inches on center from one another. In other words, the center of one stud is 16 inches away from the next. Once you find one stud, in theory, you can find all others you may need simply by measuring and marking. Be careful around windows and doors, however, as the headers and frames for these have their own rules. Also, always take into consideration the possibility of human error. We have certainly framed some rooms in my day that definitely did not follow this rule to the T.
This one was mentioned earlier and has been around probably for as long as plaster walls have. While it sounds ridiculous (no pun intended) to locate a wall beam by knocking, in conjunction with one or more of the other tactics outlined above, this is actually a pretty solid one. Think of it more as a means of finding a general area where a stud is likely located before then implementing a more precise method. Here is how it works: lightly wrap your knuckles along the wall. Where there is no stud, you will hear a deep, hollow sound, like an empty drum. Where there are studs, the sound will become more staccato and higher pitched, as there is material behind that place on the wall to muffle the sound slightly. The latter is where your stud is. This is the perfect method to use in cooperation with the knocking technique. Just like estimating values in an algebraic equation, this method is about estimating where a stud might be and then checking that math by actually piercing the plaster to look for a stud. If you are close in your estimations, and you are looking for a stud for the purposes of a wall hanging, then all the small holes you make will likely be covered anyway, so no big deal. That said, you still want to use the smallest, thinnest, finishing nail possible. These techniques can be done in isolation, or as a part of a procedure in the order, they appear above. In this way, you can be sure that you are on a stud and can observe your new well hanging, however heavy it may be, with peace of mind.